One of the easiest ways to become a professional public speaker is by speaking to groups within your current industry. In this article, we will show you a number of ways to get paid as a professional speaker without having to change careers. This article is a continuation of our previous article, How to Start a Public Speaking Career. Although this is just one of the three routes that we will cover in details, this route is one of the most common (and perhaps the most lucrative as well). So, we will spend a little more time on this one. 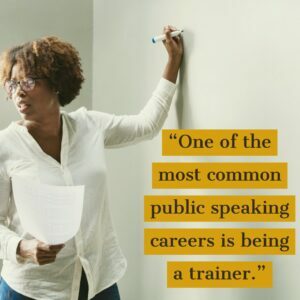 One of the most common public speaking careers (and one that most people don't realize is a role as a professional public speaker) is being a trainer. When I was in high school, I worked at a fast-food restaurant. A few months after I was hired, a new guy started. My boss asked me to show the new guy how to fix the sandwiches. I didn't realize it at the time, but my role had shifted in that few minutes from being a worker-bee to being a professional public speaker. It was just for a moment, but for that short period of time, the new guy saw me as the expert at that particular job. I had information that he needed. Incidentally, a short time later, I was promoted to supervisor. There was a small raise, and I began training more of the new employees. So, in essence, I was a professional trainer for the first time in my short career. Every single industry on the face of the Earth has to have a way to train new workers as they come into the organizations. In some cases, the jobs pay very little, but in some case, they pay a lot. For instance, my brother-in-law was a firefighter who got a second job working for a company who sales software to medical organizations. Since he was a paramedic, he had a background in medical semantics, so the company hired him train their customers to use the software. Because the training is so specialized, he gets paid a pretty generous fee, every time that he goes to a customer site. Here is one more example. One of my instructors, John, started his career working at an eye-glass retail store years ago. The store was a franchise, and the owner wasn't making a great living. One day, the owner told the staff that he was selling the franchise, and John, although, he was only making a meager hourly wage, expressed an interest. The owner, not having any other offers, self-financed the store for him. Over the next decade, though, under John's leadership, the store flourished. In fact, he eventually was able to buy two additional stores. Eventually, he sold all of the franchise stores for a huge profit, and he took some time off. Of course, he got restless. He was also driving his poor wife crazy hanging around the house all day. So, for the first time in twenty years, he went looking for a job. He ended up running the eye-glass store in front of his local Wal-Mart. Because he had so much experience running a store like this, he increased the revenue in his store over 300% his first year. The regional manager noticed, and he hired John to travel to every, single Wal-Mart in the country to train their managers and staff to do what he had done in his own stores. The point is that training, when done well, is a fantastic investment for any company. If you becaome a great trainer, you can make a fantastic living doing it. Last week, I mentioned that one of my first instructors was a CPA who made extra income teaching for the CPA's association. I also mentioned that these organization, because the require continuing education, are much easier to teach within. What if you are in an industry that doesn't require continuing education, though? The truth is, that it doesn't matter a whole lot. It just takes a little more research. Just about every industry has some type of group or association that represents the industry. US News published an article called 10 Strange Lobbying Groups That We Swear Are Real which is pretty funny. Among the groups listed are The US Association of Reptile Keepers, The American Dehydrated Onion and Garlic association, and the Balloon Council. According to the article, the last one had a pretty busy year, because there was a shortage of helium that year. Each of these associations have meetings, and every meeting requires speakers to present. For instance, today, as I'm writing this post, FLOAT 2019 is going on. This is the convention for balloon enthusiasts. (According to their website at http://www.floatconvention.com/general-classes, the event is SOLD OUT!) One of the sessions is called "Baby Boom". The speaker is showing the audience how to cash in on baby showers in today's world. One question that you might have about these types of speeches is, "Do you actually get paid to do these types of presentations?" Well, in some cases, yes. Conventions hire me all the time to do breakout sessions and keynote speeches. In most cases, though, not really. You might get a small honorarium or a free trade show booth, but many of these types of speeches are done on a volunteer basis. However, if you are trying to start a speaking career, these are great places to get on stage, get a video of you speaking, and also get a your first raving fans. Become a Consultant. 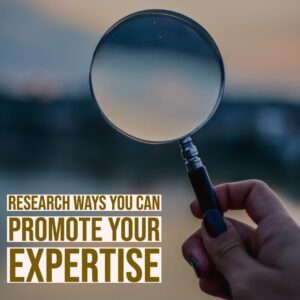 Sell Your Expertise to Others Who Want to Do What You Do. 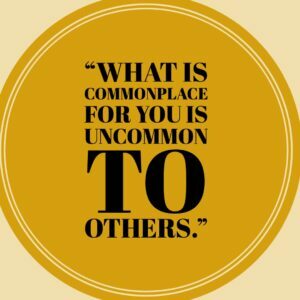 One of the things that professional public speakers know that others don't is that what is common place for you is uncommon to others. 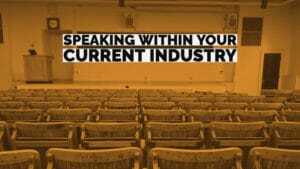 The information that you have about your industry can be very helpful to people who are either new to the industry or... for want of a better phrase, less successful than you. The great news for you is that, with the technology that is available today, you can sell this knowledge without incurring any expense on your part. When I was in college, some of the professors had their own books, and they required their students to purchase those textbooks for the class. I had one graduate assistant, though, who taught a lab class for us, and this guy didn't have a book yet. However, he started the class by saying, "If you plan on attending every single one of these classes, taking notes, and studying, you will make an A. If you feel like you may miss a class somewhere along the way, you can go to the bookstore an purchase my notes." Every person in class headed for the campus bookstore and purchased photocopies of his handwritten notes. (And I'm pretty sure that we all made A's." I made money from the book a number of ways. First, since it was listed on Amazon, I got a few purchases through their organic search results. I also bought Google pay-per-click ads that sent people to the Amazon page for the book. However, the bigger fees were collected from speaking events. In some cases, I would speak for a small honorarium, but I'd setup a table at the back of the room where audience members could buy my book (and later audio recordings). However, in some cases, at the end of the conversation with the meeting planner who was hiring me to speak, I'd ask if she wanted me to bring one of my books for every audience member. For these meetings, if there were 100 audience members, I might only receive $500 for speaking, but 100 books at $10 each would add an extra $1000 to my fee. Typically, I'd stay at the back of the room signing autographs for an hour or more after my speech. During this time, I always got dozens of people ask me to speak for their groups as well. Today, though, you have a lot more opportunities than I had when I started. A simple, webcam recording along with a free movie maker program, like iMovie, will create much more professional recordings than I was able to do in a studio years ago. If you don't like to write but are a good speaker, make a recording of yourself giving a presentation. Then send the recording to a transcriber on Guru.com, eLance, Fiverr or some other contractor website. That transcript can be a handout, mini-book, or if you put a few together, a full-length book. Click here to see how you can create the perfect seminar handout for your next presentation. If you really want to get paid speaking gigs, you have to have written material that you have created and videos of you speaking in front of groups. So, the ideas in this post are good ways to get started. In the next post, we're going to show you have you can also become a professional public speaker by using your presentations to market yourself!